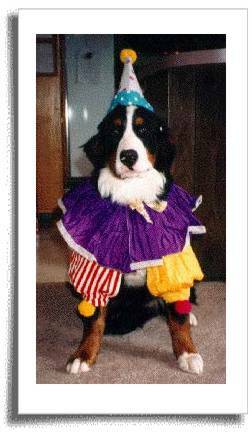 The home page for the du Coeur Bernese Mountain Dogs site. An index to all the content on this site. 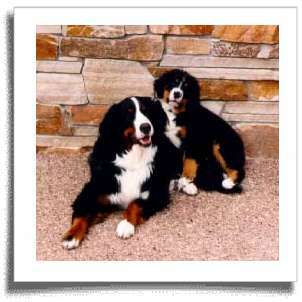 Our philosophy for breeding, raising and showing Bernese Mountain Dogs. 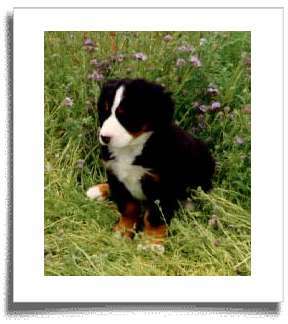 Photos of puppies, plus links to puppy resources. This is a list of the dogs we feature on this website. Click on a dog's name to learn more about it. 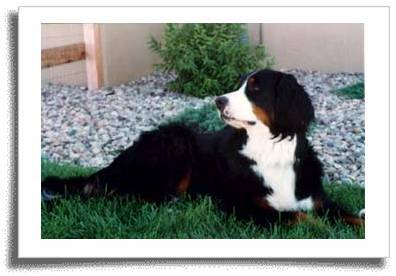 This section of the web site has all kinds of other information about Bernese Mountain Dogs or dogs, in general, not necessarily related to our dogs or kennel. Let us know what you think of our website, or contact us with any questions. Type a word or two in the box above and click the "submit" button to do a quick search. This link will take you to a page with some basic statistics about this site. Heidi was born in a small village near Montreaux, Switzerland on 17 April 1993. We had hoped to breed Heidi to Indy, but she was diagnosed with hip dysplasia at about 9 months old so we had her spayed. She turned her attention from being a potential mother to being a therapy dog. 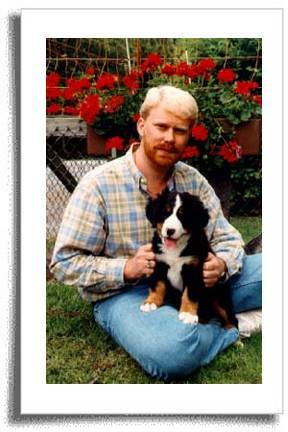 For an hour every Wednesday morning Heidi and Rick jointly participate in an animal assisted therapy (AAT) program working with children. AAT can be a powerful tool to help children build self esteem, overcome the trauma of abuse or neglect, learn to deal with attention deficiencies, promote linear and logical thinking skills, communicate more effectively, etc. Working with kids seems to be a natural skill of Heidi’s—she just seems to know what to do when to help us accomplish our therapy goals. She loves the kids. They love her. And we are constantly learning about the things that go on in the world, Heidi and her skills, and ourselves. Here is a photo of Heidi at 8-weeks old. Heidi and Rick and Heidi’s breeder’s in Switzerland. Heidi in her Halloween costume—and not happy about it. Heidi and her favorite little sister, Margaux. At this writing, Heidi is over 11 years old. She has retired from AAT and now spends her days annoying Lynne. Permalink | eMail this article.